You have a lot of choices to sift through when it comes to finding the perfect fifth wheel. Thankfully, Keystone RV made that choice a little easier with their Cougar lineup of fifth wheels. With features to please even the most discerning of RVers, there truly is something for everyone in a Cougar fifth wheel. And with a range of decor options and price ranges, you know you’ll find the perfect fifth wheel to fit your travel needs. Innovative design choices has made Keystone RV Cougar fifth wheels a top choices for RVers, and it all begins with the construction. Startings with its five-sided aluminum superstructure, a Cougar fifth wheel is built with high gloss clay medallion fiberglass sidewalls, one-piece T.P.O. roof membrane, and a woven moisture and vapor barrier, all built on a 10″ powder coated steel I-beam. This is design made to last, and with MOR/ryde CRE 3000 suspension, you’ll be traveling longer and sturdier than the rest. Speaking of traveling longer, with the upgraded Polar Package Plus, you can take your Cougar fifth wheel to the extreme with a completely enclosed upgraded insulation package. Tested to endure zero degree temperatures, this is the package for full-timers who don’t head south for the winter. 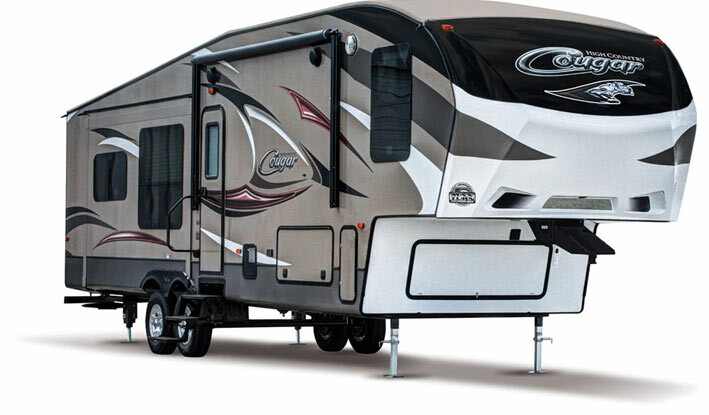 As a fifth wheel made for the long haul, the Cougar lineup offers a range of tasteful decors. Because what difference does it make if a fifth wheel is built to last, if you don’t enjoy spending time in it? 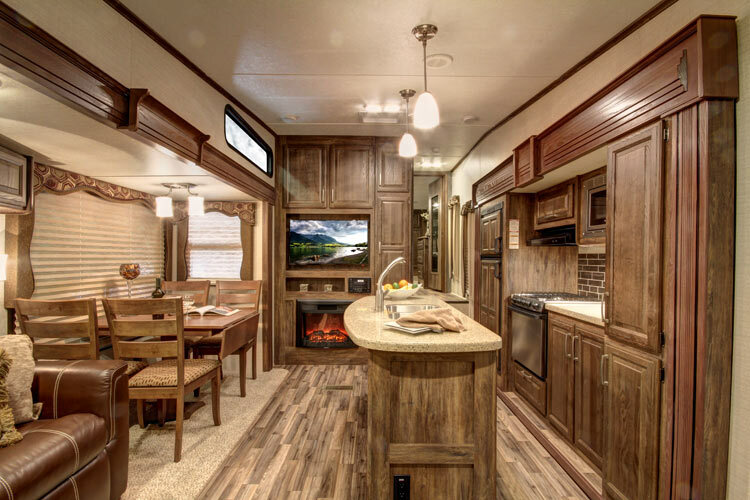 With its absolutely beautiful interior, the Cougar fifth wheel lineup promises to delight. Just wait till you see the executive kitchen with its 8 cubic foot refrigerator, 22″ stainless steel oven, and solid surface countertops. And if relaxing by the fireplace is your style, then kick back in the plush living room sofa and enjoy the view. With its industry leading design and perfectly executed construction, is there any wonder why Cougar fifth wheels are rated highest in their class year after year (for the past 14 years! ), or why they have the highest resale value in the industry? Visit our Duluth, MN location today to see for yourself what an industry leading fifth wheel looks like!